The destroyer Zumwalt is back in port after completing builder’s trials. The U.S. Navy’s next generation guided missile destroyer USS Zumwalt returned to General Dynamics Bath Iron Works shipyard in Maine after successfully completing builder’s trials, according to a U.S. Navy press release published by USNI News. The tests in particular focused on the ship’s Advanced Induction Motor and the so-called Integrated Propulsion System. The USS Zumwalt is to be handed over to the U.S. Navy for inspection and acceptance trials next month. The inspection and trials will only involve the ship’s hull, as well as its mechanical and electrical systems. 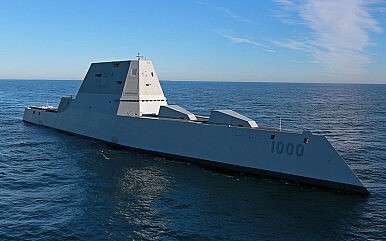 After the ship’s delivery and acceptance it will be transferred to San Diego, where the majority of the Zumwalt’s combat systems will be installed. The lead ship of the U.S. Navy’s new destroyer class already conducted sea-tests and trials in the Atlantic Ocean in December 2015. The April rough-weather trials to assess the seaworthiness of the ship will be of particular importance given the controversy surrounding the ship’s design. Specifically designed for land-attack missions, the USS Zumwalt will be one of the most heavily armed surface ships in the world, capable of striking its targets far inland. “Each ship features a battery of two Advanced Gun Systems (AGS) firing Long-Range Land Attack Projectiles (LRLAP) that reach up to 63 nautical miles [72 miles, 115 kilometers], providing a three-fold range improvement in naval surface fires coverage,” according to the U.S. Navy website. The ship is slated to achieve initial operational capability in October.